Whether it is walking around our neighborhood or hiking at our local state park, we can usually spy at least one of the topics from our list. There are so many great preschool science books. I'll just pick one or two books that cover a topic on our list and read it during our read-aloud time. Occasionally I'll put together a little themed nature basket that contains books, binoculars, magnifying glass and other hands-on objects that relate to the subject. When we do family nature walks, my older children would sometimes draw in their nature notebooks. My younger children wanted their own journals so I made printable nature journals that are just their size. These journals are made from paper bags. My preschool children fill out and glue various pages into their books. When finished, it makes a great booklet to read and reread! I'll also mix in a more formal nature study unit. Recently we've been learning about hummingbirds. We've created a hummingbird observation center in our living room, read books, watched videos, and started a hummingbird nature journal. As much as I like keeping critters outside, sometimes it is easier to bring nature in to study! We've brought in ants, worms, butterflies, ladybugs, tadpoles and fish to observe up-close. We also might bring in other nature treasures such as rocks, pinecones, seeds, twigs, flowers and more! Coloring pages, nature puzzles, animal charades, I Spy games and more give me lots of opportunities to talk with my children about various nature topics. 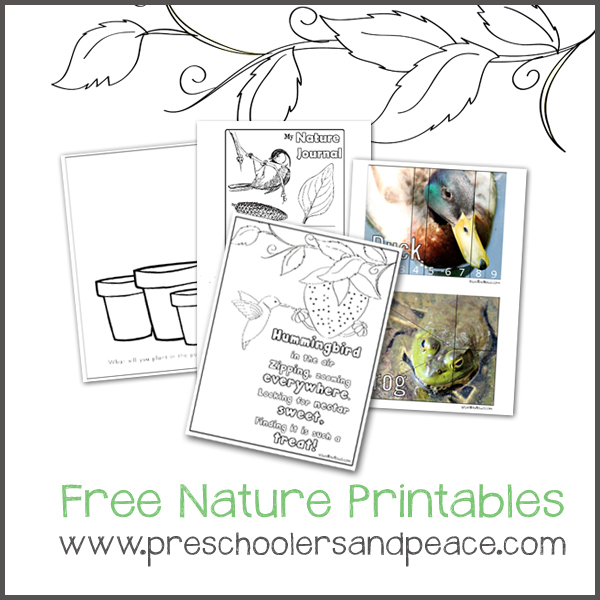 I've included a couple of free nature-related printables to get you started on your nature study journey! There is an open-ended drawing printable, a great hummingbird coloring page, two nature journal pages, and two animal puzzles. Do you have any spring-related nature study goals? Any nature study tips to share? 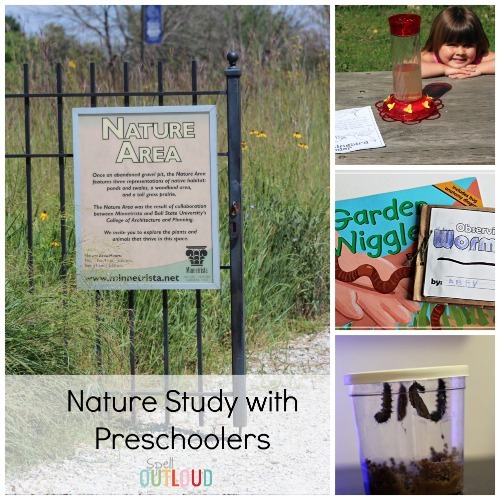 affiliate link: Get Nature Study Printables for Toddlers and Preschoolers + the Hummingbirds Unit Study for just $5.00 - such a great summer Circle Time activity! Maureen Spell is a former elementary school teacher who now has a classroom of 7 at home. She blogs at Spell Outloud, a blog that has nothing to do with spelling and everything to do with learning. With kids ranging from toddler to teen, she highlights many homeschool activities, toddler and preschool crafts, and free printables. Stop by her blog for more preschool science activities.